Can a cruise line keep a refund that an airline intended to give to a passenger? That’s the question that Susan Swartz is asking after her recent experience. On the flight home from her Russian river cruise, she took an involuntary seat downgrade. But the cruise line took the $578 refund meant to compensate her for the uncomfortable inconvenience. Now Swartz wants the Elliott Advocacy team to retrieve her refund. Can we do it? Swartz’s case is a prime example of why self-advocacy sometimes fails even when a consumer does everything right. Her pleas for an explanation were met with silence, misinformation and even fibs. And that resistance also came from her very own travel agent, who should have been there to help. 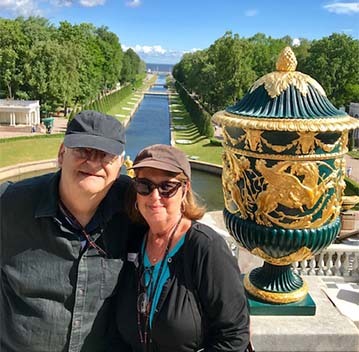 Last year, Swartz and her husband decided to try a new adventure — a Russian river cruise. Knowing that this type of trip would be better arranged by a professional, Swartz contacted a travel agency. The couple left the complicated details to their travel advisor. Vivian took care of all of the arrangements for the cruise — including booking the flights. Following their instructions, she booked the couple in the premium economy cabin for all portions of the long journey. Soon the couple set off for Russia to board their 15-day Jewels of Russia cruise. They would be cruising from Moscow to St. Petersburg on Scenic Cruises’ Tsar. The entire trip was amazing. There were only 112 passengers on the ship — marvelous food choices and planned programs. My husband and I had a grand experience! But on the way home, the duo hit a snag. When the couple disembarked from their cruise and checked their email, they found a message from Air France. Due to a change of aircraft on flight AF144 on June 24th from Paris Charles de Gaulle to Chicago, you have been rebooked in Economy class on the same flight. Being a regular reader of our site, Swartz knew that this involuntary downgrade should lead to EC 261 compensation. The terms of EC 261 entitled the couple to a 75 percent refund for the downgrade. The European Commission sets this figure. It’s based on the length of the flight and only applies to the downgraded portion of the itinerary. When Swartz arrived home, she composed a short email to Air France and began her refund request. Air France responded promptly and sent the couple two vouchers for future travel, worth 150 euros each. Often we see European airlines offer passengers vouchers instead of cash payments as reimbursement under EC 261. Travelers should be aware that they are under no obligation to accept travel vouchers. The European Commission specifies monetary compensation. And Swartz and her husband did not want the vouchers. They wanted a cash refund. So she tried again with Air France. We have just received two e-vouchers, each worth 150 euros. I told the person who called, as well as I stated in my original email, that we are both over 70 years old and will not be traveling to Europe again. We cannot use the vouchers. Can you reimburse us with a check for the amount owed to us, per your vouchers? Now Air France referred Swartz to Delta Air Lines. The Air France representative explained that Delta handles all of its North American refunds. So Swartz turned her focus to Delta Air Lines. Where is that refund from the airline? In July, Swartz began corresponding with Delta about her refund for the downgrade. And soon she received confirmation that the couple qualified for the EC 261 benefit. Delta would send a $578 check within seven days. Seven days came and went. No reimbursement check arrived. Swartz’s mission to locate her missing refund went on throughout August and into September. A Delta representative assured Swartz that the airline had sent her check in July as promised. Following the self-advocacy guidance she learned from reading Christopher Elliott’s article on the topic, Swartz slowly escalated her case up the executive chain at Delta. As she approached the top of that ladder, her hope of ever seeing her refund was waning. But she tried one more time. It seems as though with all the back and forth and different case numbers my refund check has still not been mailed to me. So, is there any way you might please follow through and see when we will be receiving a check for $578? But still, heading into October, no refund had arrived in Swartz’s mailbox. That’s when she decided to reach out to the Elliott Advocacy team for assistance. Elliott Advocacy to the rescue? When our advocacy team decides to advocate a case directly, we do so only after a consumer has tried unsuccessfully to solve their own problem. It was clear from Swartz’s paper trail that she had made an enormous effort to resolve her dilemma. Swartz sent me a protracted paper trail that spanned many months and included multiple companies. In addition to the airlines, Swartz had also asked her travel agent, Vivian, for assistance. But Vivian had no idea how to help. Actually I am surprised that they have issued a refund for the downgrade as I did not think they would. Sorry I cannot help. Good Luck. Keep me posted. Uh-oh — a travel agent who isn’t familiar with EC 261 isn’t a good sign. I carefully combed through all of the various parts of Swartz’s paper trail. I soon found the genesis of the problem. For months, Swartz had focused all her attention on Delta Air Lines and its failure to send the refund. But it had sent the refund, as promised, within days of Swartz’s first request. Thank you for your correspondence regarding the above-listed document. I am pleased to inform you that I have asked our accounting department to issue a refund check in the amount of 578.00 USD representing the value of the documents submitted. That email goes on to display the full names of the Swartzes and their ticket numbers. Swartz had missed that detail. I explained that Delta had sent her refund directly to the cruise line in July. I thought this was probably a simple oversight in such a large company. After all, Swartz had booked the cruise through an agent, who then made the final booking through Scenic. There were many layers and many agencies involved. I encouraged Swartz to ask her travel agent to reach out to Scenic and ask for her refund. At this point, the case should have quickly come to a positive conclusion. But it didn’t. One month later, in November, Swartz sent me a follow-up email. I was surprised that she was still in a battle for her refund. Michelle, I’m still trying to track down my refund check. Delta confirmed that the check was sent to Scenic Tours, USA, in July. That company told me that it has no record of any check being sent for me. At this point, I feel as if I’m going around in circles! Can you help at all? OK, Swartz had been through enough. I set about to find out who cashed this check and why the cruise line had not forwarded the refund to the couple. First, I contacted Vivian and asked her why she was unable to track down this refund for her client. With the paper trail evidence that showed that Delta mailed the check to the cruise line, it should have been easy for Vivian to help Swartz. Susan Swartz was involuntarily downgraded on her return flight from her cruise. As a result, Delta and Air France agreed to provide Mrs. Swartz and her husband a refund as per the terms of the EC 261. A check was mailed to Scenic Tours (USA) in July, as this was the entity that initially accepted the payment for this trip. Scenic Tours should have sent the refund to this couple. But it has not. We would like Scenic Tours to review its accounting and locate this refund ($578 in two checks of $289 each from Air France/Delta Air Lines). These checks were meant as reimbursement to this couple. What kind of murky reasoning is this for a cruise line to keep her downgrade refund? Within two hours of my email, Swartz’s case came to a positive conclusion. I heard back from the firm that represents Scenic Cruises with some good news for Swartz. I also heard some questionable reasoning as to why the cruise line had kept her refund. Scenic booked their flights during which the guests received a $795 air promotion. They were booked in Premium Economy. As the cost to Scenic was the same as Economy at the time of booking, essentially they received the upgrade for free. The downgrade was an action by the airline, not within Scenic control. Because the guests didn’t actually pay for the upgrade, Scenic did not believe they were entitled to an airline refund. But, as the company appreciates their situation and does try to do right by their guests, we are issuing the “refund” of $578 immediately. They should receive the check shortly. So someone at Scenic determined that the Swartzes weren’t entitled to the downgrade refund — the refund that Delta Air Lines and Air France determined they were entitled to. The upgrade cost the cruise line nothing, so it’s truly puzzling how someone decided that Scenic should gain $578 from the couple’s inconvenience. Swartz is just happy to have this unpleasant situation concluded. She and her husband had a fabulous 50th-anniversary cruise, and she does not want this to continue to cloud the memories of their special celebration. And I’m happy to have been able to help. Is there any reasonable explanation for Scenic Cruises to have kept the refund for the couple's downgrade? Posted in Commentary Tagged CAN SCENIC CRUISES KEEP MY AIRLINE REFUND?, CRUISE REFUND PROBLEMS!, I TOOK AN INVOLUNTARY DOWNGRADE CAN THE CRUISE LINE KEEP MY REFUND?, THE CRUISE LINE KEPT HER EC261 COMPENSATION, THE CRUISE LINE KEPT HER EC261 REFUND, THE CRUISE LINE KEPT MY REFUND!, WHEN YOUR CRUISE LINE KEEPS YOUR REFUND ElLLIOTT ADVOCACY WILL HELP, WHERE IS HER REFUND SCENIC CRUISES?, WHY DID HER CRUISE LINE KEEP HER REFUND?, YOUR CRUISE LINE CAN'T KEEP YOUR EC261 REFUND!